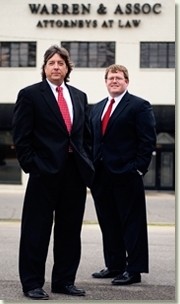 We have over 23 years of trial experience handling personal injury cases. Our firm believes in personalized care, focused attention, and a tailored legal solution for every personal injury case. After an auto accident, we will determine who is liable and work towards your desired compensation. Have you been injured in an accident due to the negligent acts of another? You may be entitled to monetary compensation for your injuries. It is vital that you have skilled legal assistance on your side throughout this process, so you obtain the full amount of compensation that you deserve. Our Jasper personal injury attorneys at Warren & Associates, LLC can provide you with high caliber representation after an accident. We are dedicated to protecting the rights of personal injury and wrongful death victims in Jasper and all throughout Walker County, AL. Our firm has been dedicated to serving the residents of Alabama for more than two decades and we have helped thousands of clients in successfully recovering full restitution. We understand the severity of your situation, and you can count on us for the legal assistance that you need. We are committed to protecting our clients' rights and we can ensure that you are treated fairly and reimbursed by the insurance companies. Our Jasper accident attorneys can offer you personal injury protection and they will treat you with compassion and respect. It is important to understand that, in order to successfully obtain compensation, you must prove several elements to your case. First, you must show that the other person acted negligently; second, that their negligence was the reason for your injuries. In order to show that they acted negligently, you must prove that they owed you a duty of care, as in the case of a red light, and that they violated this duty of care through deliberate intent or an unreasonable accident. Many elements of a personal injury case are determined by the reasonableness of the situation. The question of whether or not any other reasonable individual would have behaved or been injured in the same way is often raised. It is important that you have skilled representation on your side that can evaluate the circumstances and provide you with the aggressive representation you need. Our firm can provide this quality of representation. Take Immediate Action - Call Our Firm Today! The first thing that we will do is to meet with you, gather information, and ensure that we thoroughly understand your circumstances, as well as your desires for the future. In addition to the hospital bills and other costs of recovery, you may be experiencing financial hardships due to loss of wages. It is important that you are provided with the compensation that you need and we can help you pursue this through a personal injury lawsuit. We also offer a free case evaluation so that you may obtain legal advice and information regarding your situation before making any financial commitment to us. Further, you may also use this benefit to learn more about us and how we may approach your case. By sitting down with a Jasper injury attorney from our firm for a free consultation, we can discuss the unique elements of your situation and determine the best way to proceed. Contact our office today to discuss your situation and learn more about how we can help! Our firm proudly serves clients in Jasper, Birmingham, Carbon Hill, Cordova, Cullman, Forestdale, Homewood, Hueytown, Mountain Brook, Sumiton, Tuscaloosa and all throughout Walker County.